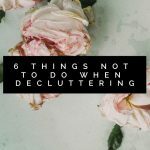 I’ve spoken before about how much better I feel when I do a round of decluttering, but sometimes the thought of it can be overwhelming so today I wanted to share 10 excellent decluttering tasks that take 30 minutes or less! 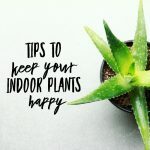 I’d love to hear your tips and ideas in the comments as well! I don’t know about you, but I have one particular kitchen drawer that if I’m not careful becomes the dumping ground for all kinds of miscellaneous items, but thankfully emptying it out and decluttering it is a small but incredibly useful task. Having tidy kitchen drawers makes finding things so much easier, saving me lots of time (and angst!) and unless I have let things get really out of hand I can whip through all of my kitchen drawers in well less than 30 minutes. It’s an excellent place to start! Still in the kitchen, the space under the sink is another excellent quick decluttering win to tackle. Not only will it allow you to do an audit of the state of all your cleaning supplies but it is an excellent opportunity to give that space a thorough scrub down as well. All kinds of items can get stashed on, or in, our bedside tables and they can quickly become home to stacks of books and random odds and ends. Clearing them off and rehoming (or disposing!) what you find there won’t take much time, but it will definitely make a big difference. I find having a clear space around my bed even helps me sleep better! My linen closet is home to not only sheets and towels, but picnic rugs, shopping bags, tea towels and all other bits and bobs, so a decluttering every now and again is definitely required. 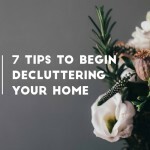 Pulling everything out, assessing what to keep and popping those items back again doesn’t take long at all, but it’s often a forgotten space so adding it to your declutter list is an excellent idea. Trying to stop it from becoming a dumping zone is the next challenge! And I’ll make it work just like when we were getting rid of trash after renovation with the help of Dependable Dumpsters Louisville service. On my own this time, though. It’s important to periodically pull out your medical supplies and check their expiry dates and do a stocktake of what you have on hand. 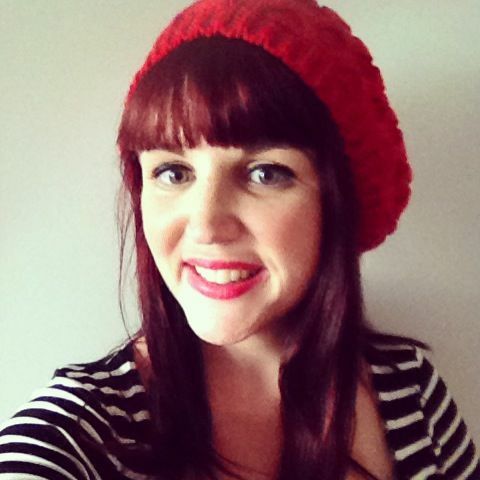 You don’t want to find yourself without a bandage or the like when you really need them, but you also don’t want to have out of date medicine either. Don’t just throw them out though, it’s best to dispose of unwanted medicine by taking it to the pharmacy, they’ll take it off your hands and dispose of it all safely. Taking some time to declutter your desk will result in a much calmer, organised work space and it shouldn’t take more than 30 minutes either! If need be start with the top of your desk and sort that out first, but don’t neglect any drawers or cupboards either. They’re notorious places to cram all kinds of paperwork, dead pens and who knows what else, so decluttering this space is definitely useful! Even though I’m not much of a shoe person I still find myself with more shoes than I really want or need, so a periodical decluttering of my shoes is definitely a useful task and it doesn’t need to take long. Throw out any that are beyond repairing, donate or sell any that you never wear and then pop back those pairs that are actually useful and wearable! Much like the medicine cabinet, our bathroom cabinets can become home to skincare, haircare and makeup that we haven’t used in ages, no longer need or have basically used up. A decluttering of this space is really important, and generally results in me realising how few products I actually need to have on hand. Be sure to recycle anything that you can, and if you have unopened products (from goodie bags or the like) see if you can donate them – places like women’s shelters are often in need of bathroom products. Depending on the state of your pantry this one might take a smidge over 30 minutes, but it’s definitely worth doing! Pull everything out and check for duplicates, do an audit of what you have lots of (and make that the basis of some meal planning! ), look out for anything that might be expired (or even worse, infested with pantry moths) and then put what you need to back in an organised, logical way. It’s amazing what we often find lurking at the back of our pantry! If this is the case, think about getting some better storage solutions so that you can see everything more easily. Our bookshelves can become home to books we have never read, or read once and will never read again, as well as a range of knick-knacks and the like. Decluttering your bookshelves generally isn’t a lengthy task and can result in an excellent collection of items that can find better homes via an op-shop, and create space in your home (and by extension, your life). 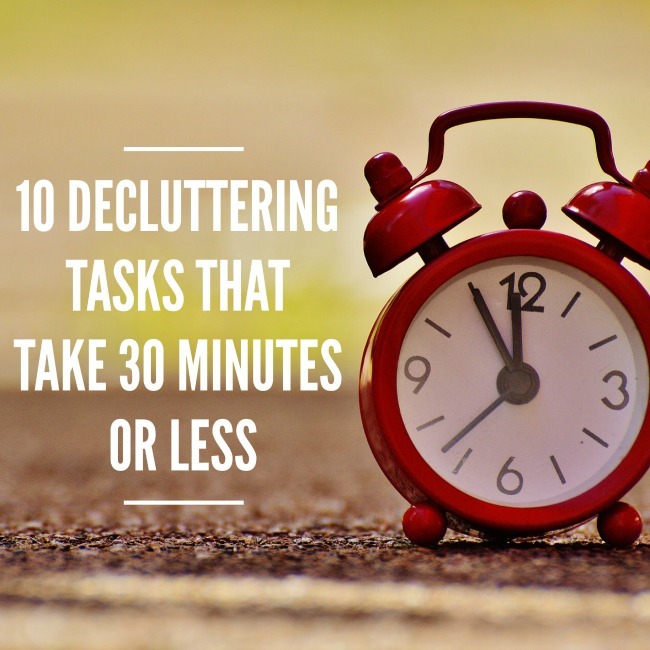 Have you tried any of these decluttering tasks that take 30 minutes or less? I was just trying to clean out my daughters wardrobe. My 4 and 2 year old were also helping so lets just say it too me much longer than I hoped!! Ah yes, ‘helpful’ kids do tend to slow things down a little! Glad to hear the tips were helpful! It’s amazing how we just keep finding things to declutter isn’t it!